I am in need of your help with my current mattress situation. About 45 days ago, I got rid of an 8 year old, too soft pillowtop and bought a doctor's choice plush mattress set from Denver Mattress. The reason i chose this set is because I slept on one at a family members house for 3 nights and had the best sleep ever, however that has not been the case for me at home. I am 5'5" and 165 lbs currently and typically sleep on my back. With this mattress, I am tossing and turning for an hour, then waking up on my side when i finally fall asleep. This morning I woke up with my feet on the bed and my leg over my knee so i know it's causing back issues as well. My options are to exchange the mattress, return the set for a full refund, or keep the mattress and get a topper. I have done more mattress shopping than most and am starting to get burnt out because I cant seem to find anything that works for me in my 1500 budget range. If I go the topper route, or the upgrade to Eurotop route, my concern would be the sinking in feeling which i do not like. Is there a firm topper out there that does not swallow you whole but still adds an extra layer of softness? Should I just get rid of the set and start over? I am in the Denver Colorado area if that helps. While I can certainly help with "how" to choose ... It's not possible to make specific suggestions or recommendations for either a mattress, manufacturers/retailers, or combinations of materials or components because the first "rule" of mattress shopping is to always remember that you are the only one that can feel what you feel on a mattress and there are too many unknowns, variables, and personal preferences involved that are unique to each person to use a formula or for anyone to be able to predict or make a specific suggestion or recommendation about which mattress or combination of materials and components or which type of mattress would be the best "match" for you in terms of "comfort", firmness, or PPP (Posture and alignment, Pressure relief, and your own Personal preferences) or how a mattress will "feel" to you or compare to another mattress based on specs (either yours or a mattress), sleeping positions, health conditions, or "theory at a distance" that can possibly be more reliable than your own careful testing (hopefully using the testing guidelines in step 4 of the tutorial) or your own personal sleeping experience (see post #2 here ). Two of the most important links in the tutorial that I would especially make sure you've read are post #2 here which has more about the different ways to choose a suitable mattress (either locally or online) that is the best "match" for you in terms of "comfort", firmness, and PPP (Posture and alignment, Pressure relief, and your own Personal preferences) that can help you assess and minimize the risks of making a choice that doesn't turn out as well as you hoped for and post #13 here which has more about the most important parts of the "value" of a mattress purchase which can help you make more meaningful quality/value comparisons between mattresses in terms of suitability (how well you will sleep), durability (how long you will sleep well), and the overall value of a mattress compared to your other finalists based on all the parts of your personal value equation that are most important to you (including the price of course and the options you have available after a purchase if your choice doesn't turn out as well as you hoped for). Outside of PPP (which is the most important part of "value"), the next most important part of the value of a mattress purchase is durability which is all about how long you will sleep well on a mattress. This is the part of your research that you can't see or "feel" and assessing the durability and useful life of a mattress depends on knowing the specifics of its construction and the type and quality of the materials inside it regardless of the name of the manufacturer on the label or how a mattress feels in a showroom or when it is relatively new so I would always make sure that you find out the information listed here so you can compare the quality of the materials and components to the durability guidelines here to make sure there are no lower quality materials or weak links in a mattress that would be a cause for concern relative to the durability and useful life of a mattress before making any purchase. 2. Checking to make sure that there are no lower quality materials or weak links in a mattress you are considering relative to your weight/BMI range that could compromise the durability and useful life of the mattress. If you think the mattress you chose is too soft, you could choose to go with something a bit less plush on top. I would not recommend buying a new mattress right away with the expectation that you’d need to modify the comfort with a topper unless you had no other reasonable options, as you’re now mixing two different variables. If you have the specifications of any mattress you're considering, feel free to post them here and I'll be happy to comment on them. I have been very happy with my purchase and am sleeping comfortably again. Sean could have easily tried to convince me to buy the more expensive sets in the store but was really knowledgeable on the mattresses and was more concerned about finding the best set for me. I would recommend them over and over again. I haven't spoken with Sean in a while but I am happy that you continue to sleep well on your one year old mattress … thanks for taking the time to share your comments about your experience with Sleep Nation along with another update. I appreciate it! Hope I'm not hijacking this thread but I also need mattress help. I went to a mattress store today and the salesman didn't seem to know much about mattresses (warning sign I know). I was looking at a Therapedic Ashby mattress and I couldn't determine if the mattress is made with quality material. Can anyone help? Attached is a photo I took of the spec sheet. Thanks. @BackPain100 - The resident expert on Therapedic and TMU forum member is Jeff Scheuer, owner of Mattress To Go . He would be best qualified to answer your question and is extremely knowledgeable, however there seems to currently be an issue with his Expert Member Section of the forum. It isn't allowing any posts, neither new posts nor adding to an existing thread. He may see your post and respond even though it's not in his forum, but if not I'd suggest contacting him directly and I'm sure he'd be more than happy to assist you and address your concerns. He's a very friendly and accommodating guy. His phone number and email address are in his contact page linked to above. @SD ~ Jeff (Mattress To Go) does not carry Ashby in his shop nor does he list it anywhere on his site for the same reasons as the ones mentioned to BackPain100 below. • Therapedic is a mattress brand licensing group sold through independent regional mattress manufacturing companies. • Each licensee can design, make and sell models of mattresses that are unique to their company under the Therapedic trade brand name. • Ashby is likely one of these models, made by the Therapedic licensee in Tampa, FL and sold at Famous Tate. Queen mattress in the price range of $499.98; $599.98 with wood foundation using pocketed coils such as this are typically promotional mattress. 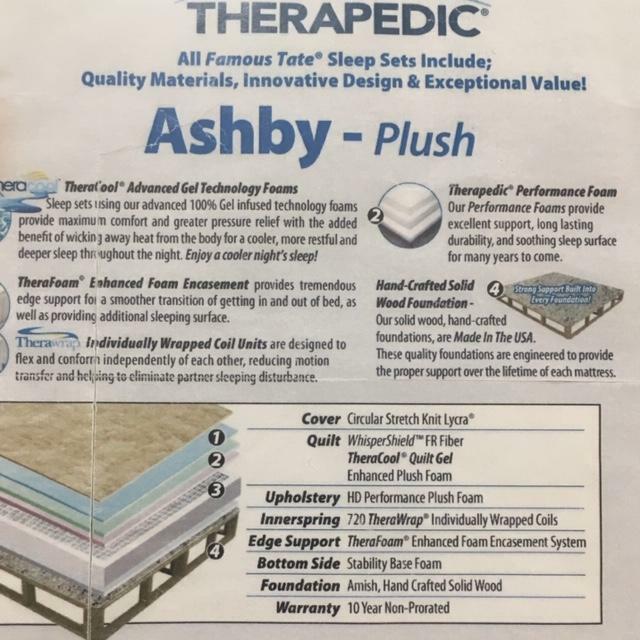 While they advertise Ashby as having a layer of HD polyfoam, they don't list the layer thickness and the ILD which would allow you to make meaningful value/quality comparisons. If the layer is 1.5lbs, which is the minimum density of a foam with an HD claim, then this most likely will soften in a short period of time and will compress after a few years. (HD density foams range between 1.5 to 2.4 lbs/ft3) The minimum I'd recommend for a one side mattress for normal BMI ranges for layers thicker than 1.5" would be 1.8 lbs foam that would be a better guideline and generally would be considered to be the bottom end of high-quality polyfoam.) As usual, for any mattress that you are considering you’d want to find out the information listed here [url] so you can compare the quality of the materials and components to the durability guidelines here to make sure there are no lower quality materials or weak links in a mattress that would be a cause for concern relative to the durability and useful life of a mattress before making any purchase. When a lower budget is a limiting factor as part of one's personal value equation it usually comes with some tradeoffs in terms of quality. A promotional mattress is made with components that are less expensive, therefore lower quality. If the mattress meets the customer’s PPP (Posture and alignment, Pressure relief, and Personal preferences) I'd expect to have 1 to 5 years of useful life out of it depending on the BMI of the consumer. People with higher BMIs can expect less life cycle as they generally require higher quality and more durable materials and components. Typically body impressions under 1.5" are not usually covered by a warranty claim. A 1.5” depression is considered a “standard” within the innerspring industry for a warrantable defect, but there is no measurement for loss of comfort. If you decide to purchase the mattress I'd make sure to keep the receipt and not remove the law tag labels. Hopefully, the information in this reply will help with your decision and I'd make sure to run everything by all the other parts of your personal value equation that are most important to you (including the price of course and the options you have available after a purchase if your choice doesn't turn out as well as you hoped for). Let us know if you have further questions ... and I or any of the Expert members of the site would be happy to help. Thank you for the replies. I've decided to go with a higher end mattress because I want something that will last 5-10 years. I'm looking at some of the mattress companies that are members of this forum. Avoiding the lower end mattresses that use lower quality and less durable materials is a great start …I applaud your decision. While I’ve seen that you already reached out to Luma Sleep one of our Expert members I'm not sure what you've read since you found our site …and just in case you haven't read it yet ... the first place to start your research is the mattress shopping tutorial here which includes all the basic information, steps, and guidelines that can help you make the best possible choice ... and of course how and why to avoid the worst ones. Support/alignment and comfort/pressure relief are the two most important functions of a mattress for everyone so you’d need to determine with each mattress that you are considering whether it will be a suitable choice that provides you with both based either on your own careful testing and personal experience when you sleep on it (and some local testing may give you a great deal of information and help you narrow down your choices ... or/and....as you are already doing ... seeking the guidance from an /knowledgeable and experienced expert retailer/manufacturer that has your best interests at heart and who can help "talk you through" the specifics of their mattresses and the properties and "feel" of the materials they are using (resilience, firmness etc.) and the options they have available that may be the best "match" for you based on the information you provide them, any local testing you have done or mattresses you have slept on and liked or other mattresses you are considering that they are familiar with, and the "averages" of other customers that are similar to you. They will know more about "matching" their specific mattress designs and firmness levels to different body types, sleeping positions, and preferences or to other mattresses that they are familiar with than anyone else. Thank you Phoenix. That’s a lot of information. I don’t trust my judgement so hopefully figuring out how to objectively test pressure relief and alignment will help. Almost all mattresses I lay on in stores seem good and I just end up leaving more confused.